iVisa.com provides expedited processing and guidance for any visa application since 2013. We are not affiliated with any Government Department. A visa is required. We can assist in processing this document. The ETA system was introduced in 1996. It provides authorization to travel to and enter Australia and is electronically linked to your passport. While checking in at the airport for your Australian-bound flight, the check-in staff can electronically confirm that you have authority to board the flight to Australia. The Australian ETA is available to citizens of over 50 countries. 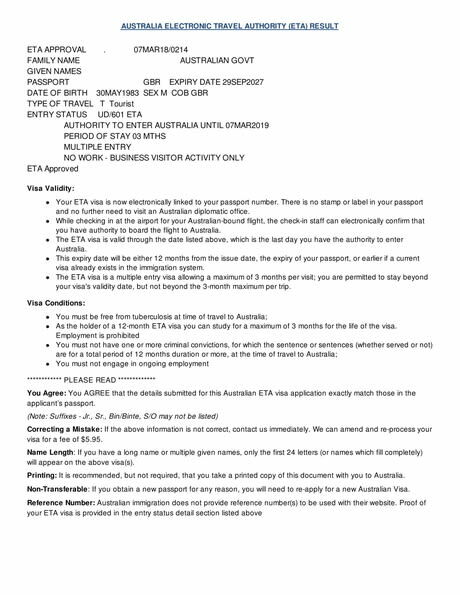 The ETA is an electronically-stored authority for travel to Australia for short-term tourist or business visits and for applicants outside Australia. It replaces the visa label or stamp in a passport and reduces the need for travelers to visit an Australian Embassy. The Australian ETA allows the holder to travel to Australia as many times as required within the validity period which is 12 months from the date of issue. The maximum length of each visit is three months. A credit/debit card or a Paypal account. The Australian ETA visa is a multiple entry 12-month visa allowing a maximum of 3 months per visit. You are permitted to stay beyond your visa's validity date, but not beyond the 3-month maximum per trip. Your ETA does not allow you to work within Australia. The ETA only allows business-visitor activity. If you have a long name or multiple given names, only the first 24 letters will appear on your visa. People with dual nationality should choose the nationality according to the passport to be used for the travel. Your passport must be valid for at least 6 months from the date of your arrival in Australia and must be an ordinary or regular passport. Your ETA visa is electronically linked to your passport number. There is no stamp or label in your passport. If you obtain a new passport for any reason, you will need to re-apply for a new Australian ETA. The ETA visa is valid through to the expiry date listed within it, which is the last day you have the authority to enter Australia. This expiration date of the Australian ETA will be either 12 months from the issue date, the expiration of your passport, or earlier if a current visa already exists in the immigration system. For example, if your ETA approval is on June 2018, but your passport expiration is in February 2019, your ETA will expire on the same date of your passport; otherwise it will expire in June 2019. An Electronic Travel Authority (ETA) provides authorization to travel to and enter Australia, and is electronically linked to your passport. It is for short-term stays for tourism or business visitor activities such as attending a conference, making business inquiries or for contractual negotiations. What do I need to apply for an Australian ETA? A credit/debit card and an email address for confirmation. What is the cost to obtain an Australian ETA? There is a service fee of 20 USD for standard processing. For rush processing and super rush processing the service fee is 50 USD and 70 USD respectively. How long does it take to obtain an Australian ETA? Standard processing time: 24 hours. Super rush processing: 0.5 hours. How long is an ETA valid for? The ETA visa is valid through to the expiry date listed within it, which is the last day you have the authority to enter Australia. This expiration date of the Australian ETA will be either 12 months from the issue date, the expiration of your passport, or earlier if a current visa already exists in the immigration system. For example, if your ETA approval is on June 2018, but your passport expiration is in February 2019, your ETA will expire on the same date of your passport; otherwise it will expire in June 2019. What conditions must the applicant’s passport meet for an ETA? Your passport must be a regular passport with the remaining validity of at least 6 months from the date of your arrival in Australia. How does the Australian ETA work? The Australian ETA allows the holder to travel to Australia as many times as desired, within the validity period which is 12 months from the date of issue. The maximum length of each visit is three months. Your ETA visa is electronically linked to your passport number. There is no stamp or label in your passport. Is my ETA valid for multiple entries? Yes, the ETA offers multiple entries. However, your maximum stay per visit is 90 days. Citizens of certain countries are eligible to apply for the Australian ETA provided they meet the required criteria. Scroll to the top of the page to determine the visa requirements for your country. I made a mistake on my application, what can I do? Please contact us ASAP via Online Chat. If your visa was processed, we can reissue a new visa for a additional $5.95 charge. Are there any restrictions for my ETA? Your visit must not be greater than 3 months (per visit). You must not have any criminal convictions. Can I apply for an ETA in Australia? No. The Australian ETA must be obtained prior to your entry into Australia. How long can I stay in Australia? The Australian ETA allows for stays of a maximum of 3 months per visit. You are permitted to stay beyond your visa's validity date, but not beyond the 3-month maximum per trip. Do I need an ETA for my children traveling to Australia with me? Yes. Everyone traveling MUST obtain an ETA before departing, regardless of their age. Each person needs to submit an application separately. If your child or children are linked to your passport, you still need to submit individual applications. If I am only passing through Australia, do I need an ETA? If you depart within 8 hours or arrival, hold confirmed onward booking documentation, and will remain in the transit lounge, you will not need an ETA. However, for certain nationalities, a transit visa may be required. Please go to [this website (https://www.homeaffairs.gov.au/lega/lega/form/immi-faqs/do-i-need-a-visa-to-transit-through-australia) for more details. Do I need to have a flight booked before applying for the visa? No. You do NOT need to provide a plane ticket. You can apply for your ETA before you have a confirmed ticket. My passport is valid for less than six months. Can I still apply for an ETA? No. You have to contact you nearest embassy for more information on how to a apply. Otherwise, you have to apply for a new passport. Do I need to enter Australia on the exact date specified on my ETA? No, you do not. The validity period of your ETA begins from the date specified in your approved ETA. You can enter Australia on any date within this validity period. What if I want to enter Australia before my ETA validity period? You must complete a new ETA application. The previous ETA application will be canceled once the new ETA is issued. If I already possess a valid Australian ETA, can I apply for a new one? A new ETA cannot be obtained using the same passport until that actual ETA expires. If you lose the passport which contains the actual and valid ETA you may apply for a fresh ETA by paying the relevant fee again. How do I know if my Australian ETA is still valid for travel to Australia? If you have applied for an ETA, you can inquire through this site to find out its current status. You will need to log in in order to make this inquiry and renew your ETA if it is necessary. You probably know how Australia started to exist in the formula we have today. It was this island where the British would send their prisoners in exile to separate them from the general public. Even though the British ended up setting a penal colony in Australia, it was, in fact, the Dutch who marked the European arrival. So, in a country formed by immigrants, it would be rather silly to not be able to migrate, don’t you think? It is not accurate to say that the whole of Australia was a penal colony. We still have the indigenous people. And of course, more nations followed the British in forming their own colonies. Even so, that is of little importance now. It may be helpful to remember the history, to not repeat it as they say, but we need to think of the future. The question that may be on your minds is whether or not Australia is welcoming. The shortest answer is that yes, it is very welcoming. But it seems that not for everyone. You may have heard in the news that president Trump recently went on a visit and made fun of Australia’s policy of letting people in. We are all familiar with his immigration policy, but leaving that aside, is there any truth in that? Apparently, Australia was not as ‘nice’ as it is now. It had this conflict with people who would arrive on the continent by boat illegally. While that is not a bad thing because you cannot simply go to a foreign country without permission, it still is a serious issue. No country will accept that. Unless, of course, if you are from the European Union and you travel within the community. Anyway, getting back to our Australia story, the problem was regarding the refugees. It is my understanding that the whole story began back in 2001 when a Norwegian freighter, the MV Tampa, rescued more than 400 Iraqis and Afghans from a sinking ship. The story goes deeper than that, but this is the most recent issue. The freighter entered Australia’s waters and wished to leave all the survivors there, but the operation was refused. That is when Australia got some international attention as far as immigration is concerned. You cannot really blame the Australian officials. They wanted to maintain their country safe from illegal immigrants. Since it is surrounded by water, every foreigner that arrives by boat is thoroughly checked for contraband and whatnot. That is why my advice is that if you want to travel to Australia, take a flight. You still have to deal with customs and all that, but the process is far easier to go through. The Australian officials still managed the immigration problem very well, if you ask me. Of course, the international community and the human rights advocates were up in a roar when the two off-shore detention centers, one in Nauru and the other in Manus Island in Papua New Guinea, opened, and as a result, the Supreme Court declared Manus illegal and demanded to be shut down. Which actually happened in 2017. Even so, people are still held in Manus, but they live in special build accommodations, and their circumstances are not much changed. To be honest, I do not know what the fuss is about all that. If someone comes and sets up a tent in your yard, do you let him live there? Not really, right? After all, it is your yard which you own for yourself and your family. Not some stranger. It is the same with Australia’s leaders. Their first duty is to their citizens, not refugees or other immigrants. However harsh that may seem, the truth is not always flowers and rainbows. Even so, you should probably know that Australia’s is number 6 on the list of most welcoming countries for refugees. It seems that the whole scandal with the freighter as well as with the other following policies made them change their minds. Of course, they still have rules, but they found a way to manage immigration and satisfy the public at the same time. 12 thousand Syrian refugees came to Australia during the migration, and that is because 84% of its citizens believed that people running from war should be welcomed and helped, not cast away. Just so you know, the global average (of the same opinion) was 73%. As you can see, Australians seems to have opened their arms and their borders more than most countries. So what does that means for you? Perhaps nothing. You probably applied online for an Electronic Travel Authorization, and you plan to go to Australia as a tourist. Even so, if you are interested in going as a worker or student, that is possible as well. Today, about 28% of Australia’s population consists of immigrants, and that is precisely because of the amended immigration policies from the last decade and a half. Plus, a lot of asylum seekers who used to come illegally to Australia by boat enjoyed political attention. This ultimately led to the situation we have today. Today, immigration is a significant nation-building project for Australia. The government not only devised entry and improved policies, but they also provide financial aid, which in itself encourages immigration. Plus, the change from the preferential treatment toward the British to an all-national nondiscriminatory policy is one of the things that make Australia one of the most welcoming states in 2018. Additionally, there is an emphasis on economic criteria for all categories of migrants, both temporary and permanent. One thing that must never be forgotten is that migration is never just one state’s problem. It involves multiple governments and the relations between them. After all, asylum seekers may want to go back home or resettled. Even so, what Australia learned and we can take as an example is that migrants contribute both economically and socially. After all, how do you think that Australia became so economically competitive? It all started when they stopped preferring only European migrants and became multicultural. Do you actually believe that the change has nothing to do with their advancement in the world? Which one do I need? The Australia ETA or visa? Do I need a Business ETA for Australia? Do I need an Australia ETA or an eVisitor? Is the Australia ETA free? Must I apply for an Australia ETA straight at the issuing authority? Do I need an ETA or a travel visa for Australia? Can I get an ETA for Australia online? Must I get an ETA or a tourist visa for a trip to Australia? An e-Visa is an official document permitting entry into and travel within a certain country. The e-Visa is an alternative to visas issued at the ports of entry or visiting an embassy/consulate to obtain traditional paper visas. e-Visas are linked electronically to the traveler's passport. How do I know when I need a visa? Our service starts with information. You can use our up-to-date visa requirements tool to search if you need a travel visa. It's as simple as telling us where you are from and where you are going. Based on this information we will tell you how much the visa costs, the number of entries, the start date and give you an action step such as applying directly on our site! How long is my visa valid for and how much does it cost? The best place to find this information is our visa requirement tool. Each country has different entry rules and visa fees. If you are in a rush you can also apply online and the form will give you this information as well. Once I apply, when I will receive my visa? It depends on the country issuing the visa. For many countries such as Australia ETA and Turkey e-Visa, the process can be done in 15 minutes through our rush service. For other countries such as the India tourist Visa, the process usually takes 24 hours. The exact time can be found on each application form. What we guarantee is that your application with iVisa will be the fastest way to apply anywhere. What are the specifications for printing the e-Visa? The documents must be printed on a sheet of blank A4 white paper. Double-side or reduced printing will not be accepted. We help you get your travel visa in the simplest and fastest way possible. Through easy-to-use online application forms and world-class 24/7 customer service, we make the whole visa process quick and simple! We also use best practices when it comes to protecting your data and credit card. What kind of visas does iVisa process? iVisa offers two types of Visa: Electronic visas (e-Visas) and traditional paper visas, based on your destination. In addition, we also offer the following services/documents that are required by certain countries: ETA (electronic travel authorization), Tourist Cards, Visa on Arrival pre-registration/approval form, Tourist Invitation Letters, and Embassy Registration service. Select the type of visa and read the instructions carefully. Pay using a Visa Card, Mastercard or other debit card. Await approval via email, then download and print the e-Visa from your account. Present your printed e-Visa to the immigration officer at the port of entry. Why does iVisa charge a service fee? Please note most countries offer the ability to process a travel visa without a service fee. The main reason we process thousands of travel visas per month is we save you time and frustration. Our service includes an easy to use website and application form. It is much easier to process your application with us especially for mobile users and large groups. We send all of our clients the visa days before travel. This is especially helpful for those passengers who purchase the visa months in advance. We also have a 24-hour customer service with professionals that are based in the United States and speak English. We accept multi-currencies and our website can be translated into over 20 languages. We believe our fee is worth your time and sanity but please note all governments do have their own "free" service. Where can I check the status of my visa application? If you have already applied on our site, please log in to your account and look for your order/application. An account is generated for you automatically after payment is received. Click the link in your confirmation email to set up a password or visit the log in page to set up the password and enter the account. Please note in most cases your visa will be delivered to you via email and can be found in your account after logging in. If my visa is rejected, do I receive a refund? If your visa application is not approved by the government agency, we will provide a full refund under our approval guarantee. If for any reason, you are not satisfied with our service please contact us via chat and we will provide a refund of your service fee. If a mistake is made on your application, we will process your visa again at no cost. Please note refunds are credited back to the same credit card used. I made a mistake on my personal information when processing the visa. Can I modify the form? If we have not processed your visa, we can make changes without a problem. We do check your information for mistakes as well. If you have already processed your visa, If we have submitted your application to the appropriate government agencies, some will allow to make changes, while others do not. Please contact us immediately (preferably through chat) if you notice an error on your application. Do I require a vaccine when traveling abroad? Some countries may require proof of yellow fever vaccination if you are arriving from a country with risk of yellow fever. You can see more info here: https://wwwnc.cdc.gov/travel/destinations/list It's the passenger´s own responsibility to verify these regulations before traveling to the chosen country. How can I get an invoice for my order? In order to download your invoice, please log in to your account and download it directly from there. What should I do if my e-Visa is lost, defaced or damaged? You may reprint the e-Visa in your email account. Alternatively, you may retrieve and reprint the e-Visa by using your iVisa account. Yes. The iVisa system does not retain your credit card information after the transaction is processed. If approved, does this guarantee my admission to the country I am applying for? All visas grant travelers the permission to travel to a country's port of entry. Whether you are granted entry or not will be at the discretion of the Immigration Officer at the entry point. If I wish to cancel my visa application, do I receive a refund? If your visa application has not been submitted for processing you will receive a full refund. However, if your application has been submitted, then we will not be able to provide a refund. Does the processing times for a visa include shipping times? When the visa has to be shipped to you, the processing times do not include this shipping time. It is from when we receive your application to obtaining the approval. Most visas (e-Visas) are sent via email upon approval so shipping times will not apply. Are you affiliated with any of the governments that you process visas for? No, we are not affiliated with any government agencies. We are a private company that specializes in processing travel visas for travelers worldwide. If my visa is not approved, can you tell me the reason? Unfortunately, we are not able to, since the government agencies do not inform us of the reason(s) behind the decisions. If my visa is not approved, what are my options? If your visa is not approved, we advise that you contact the nearest embassy/consulate for more information on what your options are. What forms of payment to you accept? We accept Visa, Master Card, American Express, and PayPal. What happens if I'm applying from an overseas territory or a dependency from another country? All citizens from these territories applying through our website will have their application processed with the nationality/citizenship specified in their passport. As an example, a traveler from Puerto Rico will have their request processed as USA nationality. This does not apply to the travelers under the BOTC (British Overseas Territories Citizen) category according to the British Overseas Territories Act of 2002.